Between jingles, the radio announces: “The best the world has to offer, all under one roof…. Nine million customers and over $300 million in sales this year. Come and see us.” The ads are for the Zona Franca free-trade zone (FTZ), a huge expanse of warehouses and malls in Punta Arenas, on the shores of the narrow Strait of Magellan in southernmost Chilean Patagonia. It’s built right on the sand spit that gave the city its name, swept by winds so strong it’s said they can drive you mad. Punta Arenas had its glory days before the construction of the Panama Canal, when it was a crucial port for ships using the Magellan strait to pass between the Atlantic and Pacific, avoiding the storms off Cape Horn. 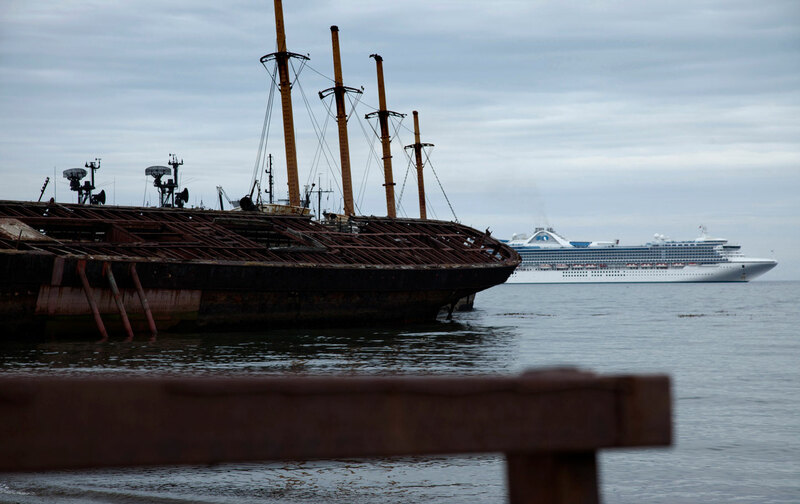 Today, cruise ships the size of apartment blocks call on their way to Ushuaia, disgorging thousands of tourists. In Punta Arenas, “the world’s end” (el fin del mundo) is a brand used to evoke fantasies. It’s applied to beer, cafés, restaurants, tour routes, and major highways: A section of Route 9 has been renamed World’s End Road. Visitors are told they are leaving everyday life behind and entering an “untouched” land on the margins of the civilized world, where everything is still possible. Those who believe it will be disappointed. The tour guides keep them on track: “You can’t leave Punta Arenas without visiting its Zona Franca, the biggest shopping mall in Patagonia.” There they discover that the modern world has invaded the world’s end, with warehouses, car dealerships, and a mall crammed with flat-screen televisions, duty-free alcohol, and camping gadgets that allow you to go back to nature in comfort. Welcome to modern Patagonia. The FTZ was established in 1977, under the Pinochet dictatorship, by the intendant of the Magallanes region, General Nilo Floody, known to human-rights organizations for his part in what was in 1973 called the “cleanup of armed extremist groups.” Under Pinochet’s labor and social-security minister José Piñera, and his team of Chicago Boys, the region became a laboratory for globalization. State-owned enterprises—oil, water, telecoms, air transport—were privatized at knockdown prices. Though Punta Arenas has no road links to the capital, Santiago, 3,000 kilometers to the north, the FTZ made it possible to buy anything you could want. The government spared no effort to attract new residents, at a time when Argentina was claiming the islands of the nearby Beagle Channel. The FTZ spearheaded regional development, a direct extension of the colonization policy that had, a century earlier, led to the extermination of the indigenous Alacaluf, Ona, and Yaghan peoples. Forty years on, the original sheds, corroded by sea spray, are still there, facing the strait. They are regularly repainted in bright colors, like dreams that need maintaining. The FTZ advertises its rising annual turnover, barely affected by the arrival of a competing shopping mall in the city, Walmart’s Espacio Urbano Pionero. Patricia Rebolledo is a guard for Securitas, which provides 24-hour security at the FTZ. Every evening, when the procession of squeaking, overloaded trolleys stops, she locks the gates, fortified with barbed wire and guard huts. These days it’s consumer goods that are locked up, but the décor hasn’t changed much since 1848, when Punta Arenas was founded as a penal colony. The damp climate was part of the prisoners’ punishment. Those who tried to escape died of cold. In 1877, after a revolt by the guards, who claimed that the government had failed to pay their allowances, and who lived in conditions almost as hard as those endured by the prisoners, the region was upgraded to a “colonial territory,” and the government sought to establish sovereignty over it through the creation of a city. There were echoes of the revolt in 2011, when Magallánicos protested over the end of a subsidy that made gas much cheaper than elsewhere in Chile. Hundreds of street barricades brought the region to a standstill, trapping tourists for a week, before the government backed down and four ministers resigned. The scale of the mobilization, unseen since the demonstrations against the Pinochet regime, was due to the fact that the gas extracted around Punta Arenas is still considered as a public good, essential in this cold region whose inhabitants see themselves as pioneers of the utopia that Chile strives to maintain on either side of the Magellan strait, despite the adverse climate and geography. In 2014, President Michelle Bachelet made the gas subsidy permanent, but Chile’s economic inequalities are still striking. Chile’s economy is divided among a dozen great families, including the Fischers, who have the FTZ concession until 2030. The Fischer group is involved in real estate and operates shopping malls and casinos throughout Chile (including the nearby Dreams casino), and in Peru, Central America, and South Africa. It also has a sizable holding in the multinational AquaChile, owned by the Puchi family, whose main business, salmon farming, has caused environmental scandals, including the destruction of the seabed around the island of Chiloé. Most Chileans make ends meet by doing a number of side jobs. Rebolledo started working at 15, to pay for her school uniform, but had to drop out when she became pregnant. Her guard wages of $420 are not enough to keep her four children. In her hut, while keeping an eye on the Zona Franca’s north gate, she reads the small ads. One is for a training course for heavy-equipment operators. A qualification would allow her to apply for a job at the huge coal mine owned by the Luksic family that has just opened on Riesco Island, a few kilometers north, angering environmentalists. She dismisses their complaints: “Mines are a godsend for us. They are what brings in the most money.” She dreams of a different job, a different life. The ocean liners glide silently by, their lights twinkling across the dark waters of the strait, with their cargo of tourists, safe and warm and dreaming of adventure. The channel they use as they head for Ushuaia, just across the border in Argentine Patagonia, is littered with wrecks. On land, the road the tourist buses use is lined with barbed-wire fences, dividing the land into individual plots. The passengers are too busy photographing the landscape with their smartphones to notice the wire, though it sums up the history of this territory. Before tourism, and its promise of virgin territory to explore, before the FTZ and its mirage of happiness through consumption, there were other Eldorados, other pioneer fantasies that vanished as quickly as they had appeared. In 1945 the discovery of oil in Tierra del Fuego, north of the Boquerón Mountains on the other side of the strait, raised high hopes. But the boom was brief. The bleak little town of Cerro Sombrero, which sprang up from nothing with a cinema, swimming pool, and amusement park, and once had the highest marriage rate in Chile, is a shadow of its former self. Pretentious statues and worn-out drill heads mark its place in history. The extraction of gas, discovered after the oil, has met a similar fate: The reserves are running low, and the operation has to go deeper with fracking. But to control the territory completely, the great families had to expel (by legal means or by force, often one and the same) the first colonists: the crowds of poor who rushed to Tierra del Fuego when gold was discovered in the early 1880s. Today, there are still a few gold prospectors in the Baquedano Mountains, in the north of Tierra del Fuego. Their life has barely changed. Gaspar Geissel digs land that doesn’t belong to him with a pickaxe. The owner lives in Santiago and has left his property in the charge of a shepherd, who tolerates Geissel’s presence. Geissel has been turning over stones and digging in riverbeds for 30 years. He works hard for little gain, but prefers it to packing salmon at the factory in Porvenir, 30 kilometers away, or the backbreaking work of maintaining the track that passes by his hut. Sometimes a few tourists come up the trail. They stop in front of the sign he has put up: “Gold Prospecting in Progress.” Geissel would like to cash in on the tourist boom: For a few pesos, they can have a brief taste of life as a miner. But once you leave the road to Ushuaia there aren’t many cars or buses, so he goes on extracting specks of gold, which he later weighs carefully, sitting by his wood-fired stove. When winter comes, and the land is once more in the grip of snow and ice, he will take the ferry to Punta Arenas to sell his gold. Meanwhile, his battery-powered radio keeps him in touch with the modern world. Every day, it tells him the news, the price of gold—and what’s on special offer at the mall. Georgi LazarevskiGeorgi Lazarevski is a documentary filmmaker. His latest is Zona Franca (2016).